the value of the capacitor on 555 timer circuit is still unknown but i will try and breadboard this soon to see if it works, and then i will know the value of the capacitor. This is excellent! I've been wanting to make lots of simple sequencer's for my modular synth, and this is just the ticket! I've been thinking of how i could do it, but didn't have the knowledge to work it out, but having gone through your design, it makes perfect sense, and is very logical! Its a shame that only the 555 chip is in my IC collection, i'll just have to put them in my next order. Will be watching this thread closely, 'Notify me when a reply is posted' Check! those diodes could be led's too?- as you are running 4016's off a 4017? Or are they meant to be led's? they are first drawn as diodes - but your right, those can be leds. Is there was a way you could chain 2 of these for a 16 step? i don´t mind if it gets a bit difficult but, if someone knows how please share the wisdom. on the first schematic there is a mistake - : connect the cathodes of the leds to ground. the cap on 555 timer is 100uF. there is a need for fine tuner for the clock circuit. if you want to "walk" the steps manually connect the point A to ground via momentary push button. dnny- you could use a counter (like the HC163), that feeds 2x 3->8 decoders (HC138). Use the 4th output of the counter to select which decoder is used. The benefit of this scheme, besides having 16 steps, is the fact that 4 switches into the counter can force it to be "presetable", so the counter *starts* at whatever number you choose. This means the length of the step sequencer is programmable This preset is loaded on reset. Use the "TC" output of the 163 to reset the counter itself. Since the 163 is synchronous reset, everything happens on a clock edge, an stays in beat. Better yet, use the 74--193 chip. It has preset and also up/down. That you are using the bilateral switches is very cool. Instead of just switching a voltage to the output posts, you can hook up 8 audio sources and switch between them. when all potentiometers are 100K then there is no need for fine tuning. i am so exited of all this things that i learn by experimenting and asking. Dnny, I don't want to state the obvious (I will) but shouldn't the reset switches just come from one single rotary? All those switches would be expensive and pointless. The gate switch idea on the other hand is excellent. Just need to do one thing at a time- get my friggin SL finished! PS I don't recommend nicotine stick-on patches. These things have a far worse withdrawal than plain cigarettes. It's been two months now of smoking no tabs. Now I'm addicted to the patches!! There howabout that for surrealism on a Saturday afternoon? I'm so spaced-out! When you close two ore more switches you are effectively shorting outputs of your counter which could give some funny effects. You could prevent this by inserting a diode for each switch, or by using a rotary switch instead of the dips (as Tom suggested). But even with the rotary you might want to use diodes, unless you are sure the rotaries steps don't overlap. No need to remove the first schematic. The forum is a good historical document. It's neat to see how things evolve over time. As for the bilateral switches: you can use normalizing jacks. Without something plugged in, it will work exactly as you have now. Plug in a signal and it works as a multiplexer. I would run the jacks throught the same posts. Not hard at all. Imagine plugging 8 radios into this beast. I did a bit of experimenting with cascading 4017's and you can create any number of steps you like, it involves using AND gates on the clk inhibit/enable pins so that the last (unused) step on the first chip inhibits it from stepping back to the start and simultaneously enables the stepping of the second chip. The first output of which is not used as this is where the second chip rests while the first steps. This principle should allow more chips to be added to the cascade, but as far as I remember it gets more complicated the further you go (multiple input AND gates etc) and you end up being better off using other chips. Great idea circuit idea, especially for people who already have lots of 4017's hanging around doin nothing!! Like me! I've just got to get my soundlab built so I can start to experiment with all this stuff. Dnny, I don't want to state the obvious (I will) but shouldn't the reset switches just come from one single rotary? All those switches would be expensive and pointless. at least here in Helsinki the DIP switches are cheaper (0.20€) than rotary switches (1.50€) and they are smaller so they fit better to my small case. and not to mention the experimental point of switching multiple resets at same time. I realised this arvo that I have a collection of SPDT mini toggles that are centre off. When I have a go at this sequencer I'm going to use those so that each step has the choice of CVonly(centre), +Gate, and last step all on one switch. Combined with the cascaded 4017 idea to give 16 outputs this would result in a very cool and still simple sequencer. Next thing is to dial up different banks of flip flops with a rotary and we have almost built a Dr Rythm!! Here's a link to a pdf data sheet that includes how to cascade 4017s. It's near the end of the pdf. Maybe i'm blind but i can't see a link. What voltage is this sequencer running on? 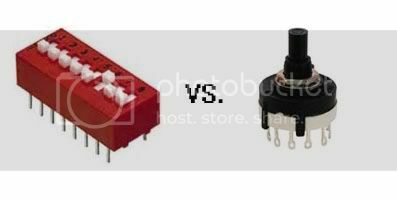 +/- 9V or +/- 12 V ? It says that point B should go to point 2 on R2, but is it possible to make it work on the ext. gate in on the SL? So its safe to say that +9v is ok, and +12 when used with a pair of voltage dividing resistors for the 4016 to reduce voltage to 9v. hi Pehr good to have some more scandinavians here - welcome . i run my prototype from 9V battery but its no prob if you are using 12V just ad some resistance to 4016 power as Macaba cleared. Put a switch on the power to switch it on or off, or experiment with putting a switch on the clock.